Asia’s rapid and unprecedented economic and social growth brings with it unexpected risks – foremost of these are devastating disasters, both natural and man-made. It is now an imperative, and no longer an option, to have on board capable leaders expertly trained in disaster risk and crisis management — leaders who can adapt to dynamic conditions, lead diverse teams in complex situations, and efficiently and effectively address pressing issues. 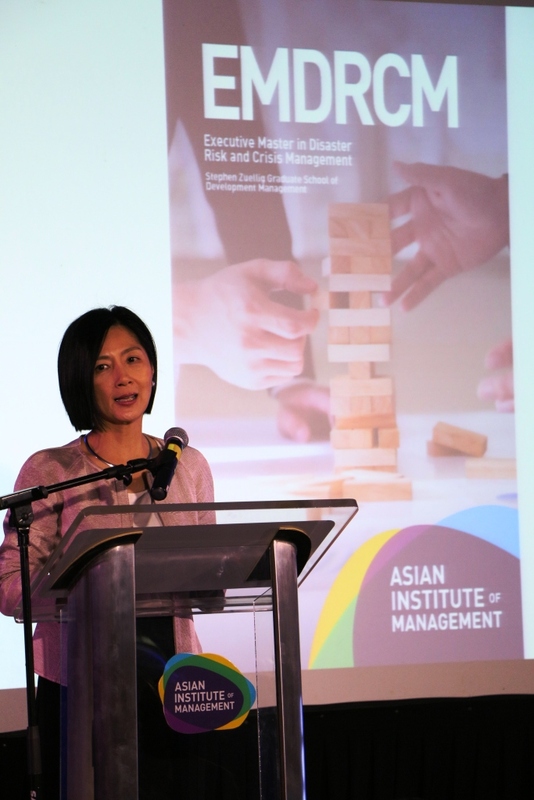 True to its mission to develop professional, entrepreneurial, and socially responsible managers and leaders, the Asian Institute of Management (AIM) launches the 18-month extensive, immersive, and practitioner-oriented Executive Master in Disaster Risk and Crisis Management (EMDRCM). EMDRCM is a five-term, part-time graduate degree program designed for students from various backgrounds and different professions. It will provide students with an opportunity to learn from experts experienced in disasters and crises in the Asian region, including the Philippines. It adopts a holistic multi-disciplinary approach that will allow students to tackle a broad range of cases in the disaster continuum. Supported by a collaborative pool of practitioners, students will have access to the latest trends, developments, and practices in the field. Furthermore, the program aims to equip students with the skills they need to build resilient Asian organizations and communities using management and leadership principles, as well as good business practices. Since business controls many basic goods and services, it ultimately needs to develop the capacity to contribute to reducing disaster risks and minimizing their adverse impact on society through organizational resilience and business continuity planning. Through the EMDRCM course offering, AIM becomes one of the few educational institutions that tackle disaster risk and crisis management from a business and management perspective. This is in contrast to most programs that are based on earth sciences, social sciences or engineering/technology studies. The graduates of the EMDRCM course are expected to be able to centrally embed themselves in different networks in order to operate in different levels and sectors. Students will learn how to assess and analyze the disaster risk and crisis environment and its operational context, and how to develop coordinated and integrated approaches to address different types of disasters and crises. They will also learn how to implement holistic and inclusive plans and programs, evidence-based strategies and innovative solutions. Finally, they will acquire skills to lead and mobilize diverse stakeholders and functions to achieve results. If you and your organization are committed to building resilience and sustaining the growth of businesses and societies in Asia, the Executive Master in Disaster Risk and Crisis Management is for you. Visit aim.edu for details on the admissions requirements or email us at drcm@aim.edu. The Asian Institute of Management is the Asian pioneer in management education. Founded in 1968 by the Harvard Business School, along with leading academic institutions in the Philippines and prominent business leaders, AIM has been actively contributing to the meaningful growth of Asian enterprise and societies by developing professional, entrepreneurial, and socially responsible leaders and managers. AIM offers postgraduate degree programs in business management, entrepreneurship, and development management and also offers various short courses and certificate programs which have helped its 43,000 alumni reach leadership positions in more than 100 countries around the world. It is the first school in Southeast Asia to receive accreditation from the US-based Association to Advance Collegiate Schools of Business (AACSB) based on the world’s highest international standards.